Digital Transformation is not the sole responsibility of any one department but often the team leading the charge is IT. Unless you are a native digital business, you are either planning for or in the middle of digital transformation. Our daily lives are becoming more digital at an incredible pace, and every business is looking for new ways to support this complete metamorphosis. Even farming/agriculture, perceived as one of the least digital industries, has embraced digital via the Internet of Things (IoT). As former General Electric president and CEO Jeff Immelt’s stated, “If you went to bed last night as an industrial company, you're going to wake up this morning as a software and analytics company.” Companies like Tokio Marine demonstrate the transformative power of going digital – they’ve recently launched a new business model that allows customers to buy one-time insurance policies covering, for instance, travel or sports and get a quote entirely online. Today, organisations of all sizes are undergoing this transformation to drive innovation, making the engagement between business and IT even more critical. Digital Transformation (DT) is not the sole responsibility of any one department but often the team leading the charge is IT. Since having the right technology is critical to support transformation efforts, CIOs and IT leaders have to become the unifying voice of their companies’ DT initiatives. Whether you are in the middle of DT or still in the planning and strategy stage, the following can provide a guide to successful digital transformation. Digital native companies change and adapt quickly, changing strategies and business processes as quickly as consumer behaviours change. If your DT plans don’t create a foundation that supports rapid change, you’ve missed the biggest reason for digital transformation. Before they can become digital, business processes must be identified and documented. This provides first critical engagement opportunity for IT and business team leaders, to connect on existing processes and potentially begin designing the post-digital version. This is also a huge opportunity to introduce automation through tools like BPM to remove many of the manual activities that “connect” front office and back office teams. According to Capgemini, 78 per cent of businesses believe their business process management (BPM) investment improved the flexibility of the organisation. Regardless of how you document or map processes (flowcharts, swimlane diagrams, state diagrams, BPM, etc.,) you should end up with two groups of processes for DT: “AS IS” processes and “TO BE” processes. Armed with a backlog of “TO BE” processes can help foster the enthusiasm for change necessary to maintain DT. As reported by Accenture, only 26 per cent of organisations say they are “completely ready” to execute their digital strategies. This is partly due to the difficulty in planning for ongoing digital disruption, something that is harder for non-digital native businesses where disruption and reinvention is something that happens over years and decades. It’s not enough for technology changes to be the foundation of a DT roadmap, but those technology changes need to enable the business to change frequently and rapidly. Change management should be built into the transformation cycle and should be one of the 4 main pillars to accelerate Digital Transformation: Implementation, Adoption, Alignment and Change. Historically long software and platform implementation cycles hamper speed and agility, often due to the need to create applications from scratch. Organisations needing better agility should look for technology that can be implemented quickly using a collection of out-of-the-box features and capabilities. Applications and platforms with out-of-the-box functionality enable IT teams to focus on configuration rather than creation from scratch, which often results in features following a standards-based approach. This often includes built-in workflow tools, business processes, and user interface elements. In addition, out-of-the-box functionality reduces the time-to-market for applications supporting new ideas. Today Artificial intelligence (AI) is emerging as a means of data-backed decision making and more personalised customer experiences. AI and Machine Learning inject intelligence into applications and business processes, quickly providing more value to end-users. Going beyond automation, AI enables data-driven process optimisation - providing insights into bottlenecks and surfacing more successful paths through a process. AI can improve adoption of new technologies and digital work by reducing manual data entry, identifying more qualified sales leads and opportunities, and routing service requests to the most qualified rep automatically. Machine learning is also being used to help organisations measure business results faster with real-time, predictive analytics. Rather than simply providing descriptive analysis of what’s happening across the business, AI can help predict future outcomes and trends as well as provide prescriptive intelligence about what to do to improve results. When technology eliminates routine, manual work and improves revenue generation it’s easier to get people to embrace new technology. Nothing will put the brakes on change like misalignment between departments and teams. From different goals to debates over whose source of truth is correct, digital transformation strategies should also find opportunities to improve alignment across the organisation. This can be accomplished by orchestrating processes across functional applications and unifying data. For example, aligning and automating processes can bridge common divides between marketing and sales, or sales and finance, and enable collaboration by creating a centralised source for critical data and analytics. Achieving operational excellence not only enables agility and efficiency, but also enables the customer-centricity and innovation that companies often seek from digital transformation. There is a natural tension between IT wanting to enable teams with more connected applications and technology, while also enabling rapid adoption and results with off-the-shelf functional applications. No one in IT wants to be a bottleneck for the business, but succumbing to app proliferation in your organisation often reinforces the same silos and barriers that digital transformation seeks to remove. Luckily, technology platforms are rapidly embracing a “low-code” methodology, with UX enhancements and configuration tools built for non-developers, that enable application development and automation without the need to do programming. For companies seeking to become more agile and accelerate their strategy execution, a low-code technology tends to be an effective way to speed up application delivery. Gartner reports that by 2020, at least 50 per cent of all new business applications will be created with high-productivity toolsets, such as low-code and no-code application development platforms. These intuitive visual interfaces with drag-and-drop capabilities leverage visual models of an app’s business logic, end-user interfaces, and processes. This makes it easier than ever to change workflows and processes as quickly as needed, and makes it possible for business users involved in the process to make changes as needed. 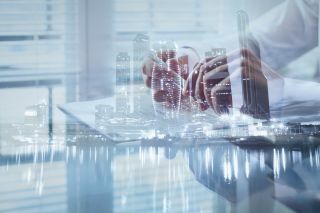 By reducing the burden on IT for small changes, and shortening application development cycles, low-code technology makes it possible to strike a balance between more connected applications that are still purpose built for the business. There is no one-size-fits-all solution to digital transformation, but the advancements made by some technology platforms can now deliver the agility and alignment promised necessary to deliver innovation and protect against disruption. By building ongoing change into the digital transformation strategy, IT leaders can build proactive organisations that are prepared to evolve and adapt.